Watchman Nee asked one of the the most poignant question ever considered by man, when he asked – “What is the Normal Christian Life?“. Well, what is it my brethren, this thing called the Christian life? What does it look like, and would you recognize it if it stood square out in front of you? I ask again, what does the real Christian life look like? Is it this earth-bound life being lived out by most western Christians all over this world? Is it expressed in the pursuit of life, liberty and happiness? Is it the manifest life being lived out by you and I? What does a real Christian live for? What is the passion and pursuit of his heart? What is his first and last thought at the beginning and end of each day? What is his place and purpose in this world, in the short life he lives on this earth? What is the preoccupation and focus of his heart? What lights his eyes, and informs his soul, and compels him from one moment to the next? What are his expectations and ideals? What is the living dynamic that enables and energizes him? What is His first love? Do you know my friends; I mean really know, as only the inner piercing of the Holy Spirit can allow you to know? Do you ever even contemplate such questions? Be careful now. There are many counterfiets and shadows in circulation. There are countless notions and assumptions about what real Christianity is and is not. Indeed, every sect and division in the faith each has their own institutional and theological answers to all these essential questions; a creed, a statement, a formalized and inviolable doctrinal affirmation. Often they are printed on a card and handed out to new converts as the beginning and the end. Yet I am not asking your church or your pastor, but you personally. Do you know? If you met a real Christian on the street tomorrow would you know it? What would give them away? Good works or a kind heart perhaps? Selfless charity? Manifest piety or devotion to the cause of Christ? We say we are Christians; all well and good. Yet are we really living the essential and authentic Christian life? Is the Living Christ being formed in us? I am not asking if you are a Christian, no not that at all, please don’t misunderstand. For that is far easier to determine. Many have said “the prayer” and claimed the blood, then maybe gone forward to some altar in the presence of the saints; perhaps even been immersed in the baptism and death of the old man. Yet this new birth, this wondrous beginning, may or may not have any bearing on how one lives and walks afterward. It is a sad reality brethren, and one that grieves the Father terribly, that so many who have received the fullness of eternal life in His Son, at so great a cost to Himself, have failed to walk in this life. For this reason also, since the day we heard of it, we have not ceased to pray for you and to ask that you may be filled with the knowledge of His will in all spiritual wisdom and understanding, so that you will walk in a manner worthy of the Lord, to please Him in all respects, bearing fruit in every good work and increasing in the knowledge of God; strengthened with all power, according to His glorious might, for the attaining of all steadfastness and patience; joyously giving thanks to the Father, who has qualified us to share in the inheritance of the saints in Light. For He rescued us from the domain of darkness, and transferred us to the kingdom of His beloved Son, in whom we have redemption, the forgiveness of sins. He is the image of the invisible God, the firstborn of all creation. For by Him all things were created, both in the heavens and on earth, visible and invisible, whether thrones or dominions or rulers or authorities—all things have been created through Him and for Him. He is before all things, and in Him all things hold together. He is also head of the body, the church; and He is the beginning, the firstborn from the dead, so that He Himself will come to have first place in everything. For it was the Father’s good pleasure for all the fullness to dwell in Him, and through Him to reconcile all things to Himself, having made peace through the blood of His cross; through Him, I say, whether things on earth or things in heaven. And although you were formerly alienated and hostile in mind, engaged in evil deeds, yet He has now reconciled you in His fleshly body through death, in order to present you before Him holy and blameless and beyond reproach— if indeed you continue in the faith firmly established and steadfast, and not moved away from the hope of the gospel that you have heard, which was proclaimed in all creation under heaven, and of which I, Paul, was made a minister…. Oh dear ones, is He being formed in us? Are we walking in Him every moment of every day? Are we being made complete in Him such that He might fill all of the Creation with Himself? Are we walking in a manner worthy of our Lord in other words? Or does each day just bring with it more of ourselves? More of our personality? More of our opinions? More self-interest? More of our best efforts and failures? More of our soul? More of our carnal appetites? More of our blood, sweat and toil? More of us seeking a place and a future in this cursed world? More religious idols that we allow to supplant Him, and eclipse Him, and shun Him in the inner sanctuary of our hearts? Oh dear ones, this must not be so, for He willingly and graciously poured out all of His life and His love for us, that we might take it up, and walk in it, and grow in it, and become something else; something new; something heavenly and mysterious, that even the angels rub their eyes to glimpse more perfectly? “Filled up to all the fullness of God.” Oh dear saints, does this sound anything like our Father in Heaven is trying to improve you or make you a better man; with all that you are still in tact, alive and well? No and never! Rather He is in intent on filling you with all the fullness of His Perfect and Beloved Son! Oh that you might see this with spiritual eyes, and that it might shatter everything that religion and self-help and humanism has wrought over 6,000 years! No, the first lie is still the only lie! You shall not be as God! Only God shall be as God! And only God; only His Son being formed in you shall put a smile on the face of the Father and blessing to His heart! And so – Is He being increased in us or are we? Oh my brethren, my heart yearns that you would see this once and for all as did John the Baptist, and put aside all and anything that confounds this wonderful and mysterious purpose. Oh that you would stop being so impressed and so compromised with religious things and religious men and religious buildings and religious formalities, and that you might see with eyes wide open in the spirit what the Father wants us to see – the beauty and the majesty, and the glory, and the absolute and universe-filling perfection that is Christ Jesus, the Son of God, the King of Kings, the Light of All the Universe! He, my friends, and He alone, is the real thing. In point of fact, He is the only thing! And His Mystic Body, what Paul reveals in his letter to the Ephesians, is what we are in the process of becoming, individually joined to Him one to one another, onward to the fullness of Christ Jesus! And He gave some as apostles, and some as prophets, and some as evangelists, and some as pastors and teachers, for the equipping of the saints for the work of service, to the building up of the body of Christ; until we all attain to the unity of the faith, and of the knowledge of the Son of God, to a mature man, to the measure of the stature which belongs to the fullness of Christ. As a result, we are no longer to be children, tossed here and there by waves and carried about by every wind of doctrine, by the trickery of men, by craftiness in deceitful scheming; but speaking the truth in love, we are to grow up in all aspects into Him who is the head, even Christ, from whom the whole body, being fitted and held together by what every joint supplies, according to the proper working of each individual part, causes the growth of the body for the building up of itself in love. Gracious Father, forgive us Lord, every single one of us, for falling prey to every lesser thing, every earthly, man-inspired thing. Oh Lord, grant us just such a heart to love Thee Father, and to allow all that it takes for Your Beloved Son to be formed in us, such that His fullness might fill everything in every way. Oh Lord, there are many out there still pretending and still patronizing groups and following men and cardboard creeds, who have utterly no idea at all what the Christian life is all about. Even worse, Lord, so many are using the name of your Precious Son as a means of worldly gain and enrichment. Oh fierce and terrible Lord, I pray not for such wolves but for your precious sheep, for whom the blood of the Lamb was spilled. I pray you will save those just as you called Noah out of the world, and Lot out of Sodom, and Israel out from Egypt prior to Your terrible wrath being poured down. Oh Lord, turn our hearts to Thee, and open our eyes that we might see such wonderful things. Save us Father, please save us in Your great mercy and long-suffering! In Jesus’ Glorious Name, we pray, Amen. Now the Apostle John tells us that the singular reason he wrote both his gospel, and what has become 1 John, is that the reader would come to know that only in Christ Jesus do we have real, spiritual, heavenly life; the life of God; a life fitted for His Kingdom and His household; the life that makes us His children; the life for the age(s) to come; a life conformed to the image of the only One upon Whom the Father has set His seal. It is interesting that John did not say he shared these things so that we might know how to live (what most religions, including so-much false Christianity, emphasize), but that we might know that in Christ Jesus we have life. He is the life we need and have, if we have come to Him in faith. Oh brethren, these are wondrous and profound truths, and I share this compilation of Scriptures that you might feel compelled in the Spirit to consider them, to meditate on them, to take them to the Lord and ask Him for help to enter into the living reality of them. John also assures us that the only life that truly matters, the quality and principle of life that measures up, is to be found “in Him”; in the Lord Jesus Christ. Then Paul augments this by saying – ““The first MAN, Adam, BECAME A LIVING SOUL.” The last Adam became a life-giving spirit.” So the life that was breathed into Adam there in the beginning, and the life imparted by the Lord to all those who come to Him in faith; these are different somehow. The one gives way to the other. It is preliminary and temporary. It is the Creator’s first thought but not His last thought, regarding the human race. The natural must be supplanted by the spiritual; what the New Testament calls “eternal” or (better still) “age-lasting” (GK – AIÓNIOS) life. Mark this dear saints, that there is something about the life of the Lord Jesus; that it is a life that cannot be contained; that it is a life that is designed to permeate all that it touches. It is the very life of God, and to think or imagine that it shares anything in common with the corruptible life of the soul, the life breathed into Adam, is to miss everything that the Spirit is teaching regarding this “newness of life”. To be breathed on by He Who is the life-giving spirit is something else entirely. Yet, do we not today have this strange phenomenon where so many “Christian” teachers are convincing so many others that Jesus came and died and rose again so that He might thereby enhance and extend our own life; that we can have “our best life now”, and forever into eternity besides? Perhaps someone needs to tell such false guides and their disciples that the only way to enter into this life, is through death; the cessation of our own life. To be born again in the spirit (of Christ) necessarily implies the end of the life that came before. To rise up out of the water of baptism, and to stand and walk in this newness of life – do we truly know what this means? That our old self, the life according to Adam, must remain behind us in the pool of death? There are many perhaps who quite happily follow the Lord for the bread and water (the food which perishes) that sustains this present life in the flesh, but turn away whenever He calls them deeper into the true meaning of His life, and the price for entering in. There are many more still who thank Him for this life, then seek to store it up in barns so that they can continue on in themselves rather than go out each morning to gather in His provision. They will go from hillside to hillside whenever there is the promise of loaves and fishes, but mention the path and the pain of the cross, and they scatter like rabbits at the firing of a gun. Oh how I wish I could confess that this does not describe myself, but the Lord knows and I cannot. We must all come to see and esteem this life above our own, and to most fully appreciate that the only real life is “in Him”. Not in ourselves even on our best days. Not in a reformed or improved Adam. Not in religion. Not in things or service. Not in doing. Not in law-keeping or the adherence to rules or regimens. Not in formalism or ritual. Not even in attempting to mimic the Lord, for this too is futility. Only His life in us can be the well-spring of living water springing up into eternal life; the very life of God. And this life can only be found on the other side of the river, on the other side of death, through the cross, through the death of the soul. For this life has been determined by the Father to reside only in His Son, and all those who abide in Him. It is for this very reason called the life of Christ, and for any man to say that He truly lives, he must confess that “to life is Christ and to die is gain” and also that “I have been crucified with Christ; and it is no longer I who live, but Christ lives in me.” No brethren, this eternal life is no mere extension of our own lives into so many numberless tomorrows, as is widely taught. There is, in the end, only one life, and to abide in that life is the reason for our salvation and existence. Although we all try in so many ways, we cannot bring our own lives into this new life that we derive in Christ Jesus. A new principle is now in effect, one that offers genuine freedom and deliverance from death, and it is something the Holy Spirit calls the “law of the Spirit of life in Christ Jesus“. Without this life, nothing else really matters. Everything is just a teaching, a concept, an empty promise. Beloved brethren, it is hoped by placing all of these glorious passages together, that the Holy Spirit will open our eyes and penetrate our hearts to the living and personal reality of the Life that the Father has sent into the world. Yet the abiding question remains – Is He our Life? And when He is revealed in glory, will we be revealed with Him? Is our life bound up in the life of the Vine and the branches? 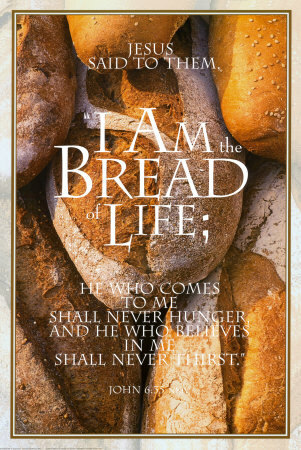 It is interesting that the majority of those who came for the life offered by the loaves and fishes never stuck around for the abundant life really being offered by the Lord Jesus Christ. With their bellies full, and strength to live on another day in themselves, they slipped away. We are not told what ultimately became of the Samaritan woman at the well who said – “Sir, give me this water, so I will not be thirsty nor come all the way here to draw.” Perhaps she did come to see that the One speaking to her was in fact the Living Water. Perhaps she is now waiting to be revealed with Him in glory when He comes into His presence. This is our hope and prayer for all of you who to come here on a regular basis; for the very most anyone can do is to help others to see that only in the Lord Jesus Christ do they truly have abundant life. Dear brethren, this is our hope and prayer in the spirit for all of you! Over Five Years in the Making! Over 300 Pages of Spirit-Touching-Bone Reality and Exhortation! A Veritable Canon Shot Across the Bow of the Laodecian Church! But a Call to the Real Thing, the Only Thing! Well folks, we are very excited to announce that our new book – The Real Thing: An Exhortation for the Authentic Christian Life is now available. After much prayer and waiting on the direction of the Spirit, we feel at this time that this resource may be a nice compliment to this online journal. My name is W.E. Smith, and I offer this series of messages to my fellow brothers and sisters in Christ with the sincerest humility and hope of blessing. To be sure, I never started out with a book such as this in mind, but merely to share some of the mighty things the Spirit of God has been revealing in recent years, as I started to behold the Lord Jesus Christ in a new way, in all of His preeminent glory. Although I have technically considered myself a Christian for most of my adult life, it was only a number of years ago that something really started to happen inside me, as I started to yearn for the authentic Christian life portrayed in the Scriptures. – was perhaps the prayer that truly changed everything in my Christian walk. The contents of this book are what I believe was the Lord’s response to this simple request. In addition to the Word of God, the Lord was ever gracious during this time to introduce me to a number of seemingly forgotten teachers of old – Andrew Murray, George Mueller, T. Austin-Sparks, G.H. Pember, Robert Govett, Watchman Nee, A.W. Tozer and Hudson Taylor, among others. Ever gradually and wonderfully, the light started to shine in my spirit, and to reveal what this thing called the Christian life was really all about. Each day brought some new and deeper revelation of the Lord Jesus Christ, as the Spirit took me on a whirlwind tour of both the Old and New Testaments. As this personal awakening began, I felt somehow compelled to share what the Holy Spirit was conveying to me, so, with much prayer and trepidation, I started an online journal called LivingWalk. This name arose rather spontaneously from a child-like and earnest desire to pursue a more dynamic, moment-by-moment relationship with my God; where I could actually hear Him and walk with Him, and bring glory to Him as His grace permitted. I suppose what I ultimately discovered over much time and travail, was that when the God of heaven and earth reveals Himself to one fully (in His Beloved Son and Holy Spirit), every man-inspired religious enterprise shows itself for what it is – artificial and empty. To have the Lord Jesus Christ in all His fullness, and to grow daily and vicariously in Him, is to have it all; everything you truly need – joy, peace, power, direction, wisdom, enlightenment, and perhaps most of all, a hunger for more of Him. To hunger and thirst for righteousness is to hunger and thirst for Him, for He is the ‘righteousness of God’ (2 Corinthians 5:21). To know what is in the Father’s vast heart pertaining to summing all things up in His Son; to abandon our own plans and to join in His plans and purposes; to see what He sees and to desire only what He desires; to breathe life only on His terms, in all of its fullness in the spirit; to be restored to the place where only the Lord sits on the throne of our heart; to live and walk in Him constantly and to have every aspect of our lives fully surrendered to His will – this is truly the end of the Christian life. To seek anything less is to shortchange our Heavenly Father’s love, and to confound His great purpose is sending His Son into the world. 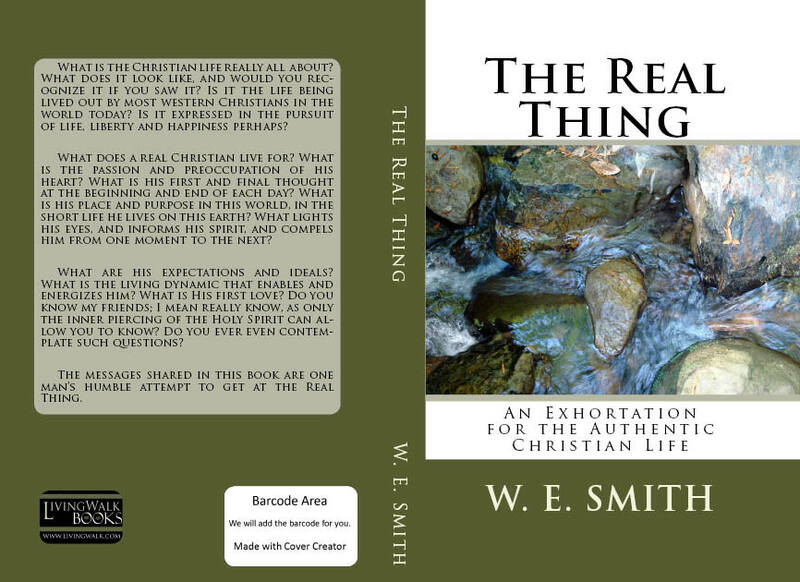 I have titled this compilation, The Real Thing: An Exhortation for the Authentic Christian Life for a couple of reasons. First, because there are, in my view, far too many false or lesser things out there representing the true Christian experience. And secondly, because this series of messages represents an expression of the gift that I have been granted by the Lord for the edification of His Body, that of exhortation (see Introduction: The Gift of Exhortation). It may be helpful to the reader to be aware that the messages presented here were not originally conceived to be shared in book form, and although some effort has been made to arrange chapters by theme or topic, each message (chapter) very much stands alone in terms of its message and content. It may also serve the reader to know that this is not primarily a book of teachings or theology, with structured points on Christian doctrine. Like the epistles of the New Testament, it is offered for believers that they might enter more fully into the practical truths of what it is assumed they already know. In this sense these words represent ‘meat’ not ‘milk’. As the title of the book suggests, the major theme addressed herein is the authentic expression of the life of Jesus Christ in one who has surrendered himself wholly to Him as a living sacrifice; the ‘real thing’ in other words. Dear Christian, if you are discouraged by men so readily replacing the “mystery of godliness” with humanly derived substitutes; if your spirit is thirsty for God and Christ alone; if you want your walk with Jesus Christ to be alive, dynamic, vibrant, intimate and truly heart-changing, then I offer these messages humbly in the hope that you may be blessed by what is presented here in the spirit. In compiling these messages, it is the author’s sincere hope and prayer that the reader will be encouraged, challenged and exhorted, such as the Spirit would permit. Any shortcomings in these messages, in terms of scriptural accuracy, interpretation or completeness is fully the weakness of the author, for which he humbly solicits the reader’s grace and kindness. Finally, we thank our ever-gracious Lord and God in advance if this little book should, even in some small way, bring spiritual edification to His people. If indeed you have been spiritually blessed by these words, we would ask that you let us know, and that you might pass this book along freely to your friends, family and fellow saints.